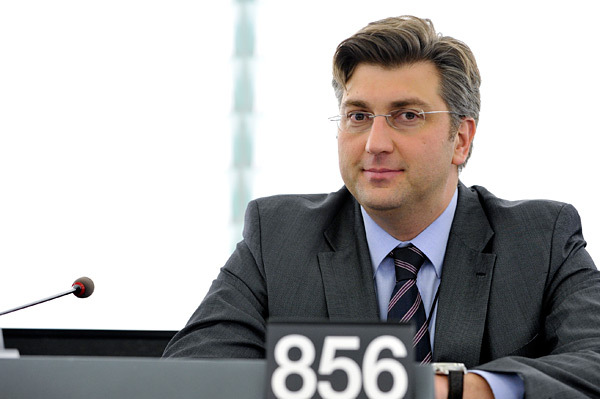 Andrej Plenković, a Croatian Member of the European Parliament, is the Head of the European Parliament’s delegation to the EU-Ukraine Parliamentary Association Committee. This new body has been established under the EU-Ukraine Association Agreement and provides a forum for communication between the European Parliament (EP) and the Verkhovna Rada. In the coming years, Plenković will become one of the key points of contact between Ukrainian MPs and the EP. The European Parliament’s delegation to the Committee will closely follow the Ukrainian parliament’s progress on pro-European reforms, including the adoption of relevant laws. This year Plenković was already the head of the EP’s election observation mission during the early Ukrainian parliamentary elections on October 26. We briefly talked with Mr. Plenković about the future work of the new Parliamentary Association Committee . – Has the Parliamentary Association Committee, which you will co-chair already been established? – Yes. Until recently, EU-Ukraine relations have been governed by the EU-Ukraine Partnership and Cooperation Agreement, and the EP delegation to Ukraine was called the EP delegation to the EU-Ukraine Parliamentary Cooperation Committee. Now, after the signature of the Association Agreement and its provisional application since November 1, 2014, the Cooperation Committee is evolving into the “Parliamentary Association Committee.” I am the head of the delegation of the European Parliament to the EU-Ukraine Parliamentary Association Committee. We have already had informal meetings with newly-elected MPs from the Verkhovna Rada to discuss preparations for the Committee’s first meeting, which we hope to host in Brussels either at the end of January or at the beginning of February. – What will the Committee focus on? Will it help the Ukrainian parliament adopt necessary laws? – The objective of a parliamentary body is to follow, from a parliamentary political point of view, the overall relationship between the EU and Ukraine. Firstly, we will discuss political criteria – the human rights situation, rule of law, decentralisation, the electoral process, reintegration of the territories, the security situation, etc. Secondly, we will closely follow the economic situation – public finances, budget, macro-financial assistance, tax reform, and other issues. We will also accompany the entire exercise of the harmonisation of Ukrainian laws with the EU acquis as well as reforms in specific sectors. The Committee is treaty-based [i.e. based on the Association Agreement]; it will meet twice a year: once in Brussels or Strasbourg and once in Kyiv or another Ukrainian city on the suggestion of Ukrainian Committee members. – Have you seen the coalition agreement that the Ukrainian parliament’s five winning parties have presented as a comprehensive plan for reforms? What is your opinion of it? – I was the head of the European Parliament’s election observation mission in October. After the elections, we met with the Ukrainian President, Prime Minister, former Chairman of the Verkhovna Rada, Foreign Minister, and other political officials. Our message was simple: we asked that they form the new coalition as soon as possible, constitute a new Verkhovna Rada, and give the mandate to the new government that should have a pro-European stable majority. This is exactly what happened. We are happy that there is a very strong political orientation toward embarking on reforms. We look forward to the complete formation of the new government, as we are still waiting to find out who will be in charge of European affairs. We are sending a strong signal about the need for good coordination between the ministries so that they can cooperate efficiently with the European Commission’s Ukraine Support Group, which was established to help Ukraine implement reforms. So, I think the government faces two equally important tasks: one is the peaceful reintegration of temporarily-occupied territories in Donetsk and Luhansk oblasts and illegally-annexed Crimea, and the other is the continuation of European-oriented reforms based on the Association Agreement. – What is the main difference between the new format (the Association Committee) and the previous one (the Cooperation Committee) in facilitating relations between the European Parliament and the Verkhovna Rada? Do these changes mean that the new committee will be primarily focused on the Association Agreement? – Certainly, it will focus on the Association Agreement. That is its purpose. The point is that the Association Agreement covers far more areas of cooperation between EU and Ukraine [than the previous Agreement] and has, as its final goal, Ukraine’s association with the EU. The association is the preparation of Ukraine’s future European membership and future European perspective. – What is the influence of this Committee on determining what assistance the EU will provide to Ukraine ? – We will continue to formulate recommendations that are then sent to the EU-Ukraine Association Council (a government-level forum). So, if we feel that there is a greater need for economic cooperation and financial assistance, a need to push for harmonising Ukrainian legislation with the EU acquis, or an increasing need for reform in the area of decentralisation, etc., we will of course articulate these recommendations as comprehensive and visible political incentives.